Preheat oven to 375° F. Grease a 12-inch round or 10 by 15-inch rectangular baking pan. Using an electric mixer, beat the butter, oil & sugar until smooth. Add egg & vanilla. Beat for 2-3 minutes until thickened. On low speed add flour, baking powder, and salt. Pat dough evenly onto baking pan. Bake for 12-14 minutes until it’s golden brown. Cool completely (about 40 minutes). While mixture cools, prepare fruit, cream cheese spread & glaze. Spread: On low speed, beat cream cheese, sugar, and vanilla for a few seconds until smooth. Glaze: Warm up the marmalade & water a little just to soften. When cookie has cooled, spread with cream cheese mixture. Decorate with fruit. Brush with glaze. 14 Comments on "Fruit Pizza"
Jenny, New to your website, but have seen a few of your recipe videos previously. They are all great! I caught on to your sense of humor, and it sets you apart. Then YOUR website. It is awesome, and so are you with making the proceeds of book sales to breast cancer research. You are one awesome lady! Thank you so much for sharing your 2005 cookbook, your knowledge and experience of cooking, and your story of your loving dad. It’s all so good to read. God bless you! I have wanted to make this but it doesn’t say what kind of marmalade, there are many out there? I use orange marmalade but there are many other glaze recipes that you can use on my fruit pizza. Due to members of the family having dairy allergies, what substitutes do you recommend for the 1% milk and the cream cheese that some of your recipes require? I absolutely ADORE your videos. I wish each of your recipes came with one. I wish I knew but I have no experience with dairy free. If they have allergies, maybe they already have products that they consume that could be used. I’m Asian and we use coconut milk and tofu a lot in our dishes. You might try using them as substitutes. Good luck ! Can u use any jam for a glaze. Not a fan of marmalade? Red currant jelly is often used as a glaze and I also like apricot jam but you can use any seedless jam. 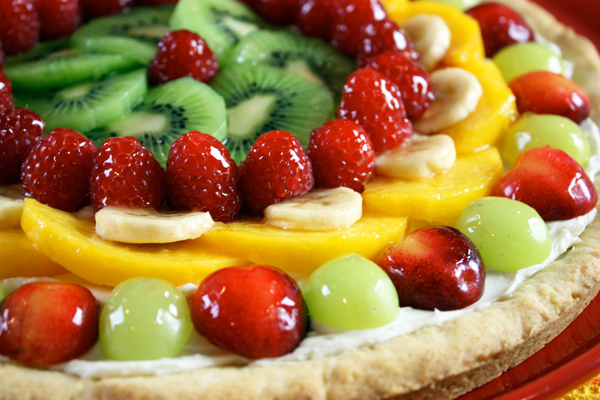 Look around at other fruit tart recipes for more glaze ideas. I made this once for my sister, instead of a birthday cake, and now that’s all she wants, so I’ve been making it for her for past 5-6 years! This one looks gorgeous! !